Today we’re going to start letting 2014 go. If you can, go through your journals from this past year. For the past few years, I have set aside 2 or 3 days to read through my year’s journals, and I make notes (on today’s page of my journal) of insights, comments, or dreams that have particularly impressed themselves on me. I also go through December of the previous year (so now I’ll be re-reading Dec. 2013) to take a look at what I wanted to remember most about the year of 2013. If that’s all you want to do today, go ahead with that. I usually write the comments on a plain blank page of my journal, then go over what I’ve written in different watercolors, then connect them on the page with yet another color from my watercolor set, for a background. I find that watercolors rarely cover over what I’ve written whereas acrylics most often do. If you have a little extra time, or don’t want to go over your journals from the year, here’s an alternate prompt. 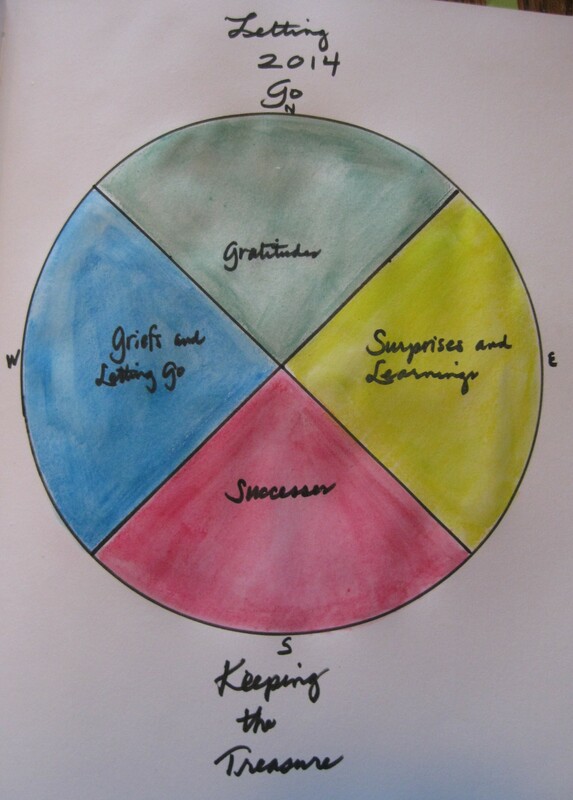 Make a diagram similar to the one in the photograph above, and label the four quadrants “Surprises and New Learnings”, “Successes”, “Griefs and Letting Go”, and “Gratitudes”. Take a little quiet time, and then fill in the quadrants with what you remember from the past year. You can add to your page throughout the next few days as different memories come up. I have found that by doing this intentional remembering, I honor what I have gone through and what I have learned. It’s a way to be conscious, to be really ALIVE to this life, to not get swept up into the overculture’s distractions which transform us from incredibly diverse human beings into perpetually dissatisfied consumers. I become aware of patterns and ongoing challenges, as well as remembering so many good things that, because they were not earth-shattering in their impacts, are so easily forgotten. I also accumulate the information that allows me to make changes that will be effective and long-lasting. For years, I would write in my journals, then put them in boxes and never read them again. Then one Christmas, at a very low time in my life, I house-sat for a friend for 10 days. Pulled out of my daily life, I decided to read through my journals — at that time, about 7 or 8 years’ worth. Since I had had many struggles during those years, I steeled myself for a difficult, depressing read, but something in me compelled me to take on the project anyway. I was blown away with what I discovered! Yes, there was plenty of venting and complaining (some of it very justified), but I also discovered a young woman who was trying so hard to do the right things in confusing life challenges, a young woman who was much stronger than my self perception at the time. I was able to say “Yes, those truly were hard years. AND I SURVIVED THEM!” I still remember the wonder and gratitude I felt when I discovered what I had written and forgotten. More recently in my life, I do my re-reads every year or so. Thankfully, my life is in general much happier than in my early adult years, so I’m not usually blown away or surprised much by anything I read in my journals. Yet, I get such a sense of owning my life and developing much compassion for myself and my struggles. There’s just enough distance between now, when I’m reading, and then, when I wrote, to allow me to see myself as if I were someone else, as if it were someone else’s story. Many of us as women are able to have more compassion for someone else than for ourselves, and this little trick has taught me how to extend my compassion towards my dear self as well. May it be so for you, in whatever ways serve you best. Day 59 of a series of daily prompts for written, visual, or art journalling, or just for pondering. For more background information, see the Intro page https://catcharissage.com/2014/10/29/announcing-sixty-days-of-visual-journalling-prompts/, or this post on visual journalling: https://catcharissage.com/2014/07/12/talking-about-journals/.